With an aim to stand tall on the expectations of our esteemed clients, we are providing Truck Tippler. Used for unloading of sugar cane, lime stone, coal silica, coconut nuts, fire wood, seeds & grains and pulse, this unloader is manufactured by our adroit professionals using the best quality components and progressive technology in adherence with industry norms. Moreover, this unloader is available in variegated sizes and specifications. Unloading of Sugar cane, Lime Stone, Coal Silica, coconut Nuts, Fire Wood, Seeds & Grains, Pulse, etc. With our rich industry experience, we provide an extensive range of Truck Loader. Our offered loader is manufactured using top notch quality components and progressive technology. Used as a free standing lift in an open yard or in front of an existing fixed height dock, this loader is widely acclaimed by our clients for its unique features like smooth movement and complete balancing. 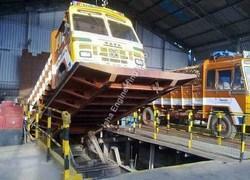 Clients can avail the offered loader from us at nominal prices. 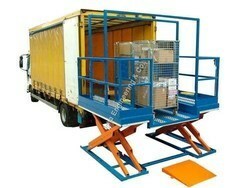 Looking for TRUCK LOADING AND UNLOADING EQUIPMENT ?